From one body to the next there was little in the way of variety; nothing to suggest that what had happened here was anything less than slaughter. Some of the corpses had been shot through the temples, others through the eye sockets. All of them were marred by the gaping exit wounds that accompany summary execution. The mottled brown mud of the river bank had caked on their skin, turning a chalky gray upon drying. Their bodies had been lined up like unevenly spaced dominoes, their heads and feet perpendicular to the river and parallel to each other. Rigor mortis had set in to a number of the corpses and, while some were temporarily fossilized into positions that reflected the anguish of their final moments, others looked strangely placid, like they had made peace with what was to come. Many of the bodies that reflected this stoic resignation had their hands bound together behind their backs, giving them an air of penitence in their postmortem reverie. The blood pools behind the heads of those most recently killed, seeped into the ground and ran away from their bodies in rivulets. In the background all you can hear is the thuck-thuck of feet trekking through the mud, coupled with hushed conversation in Arabic and the sound of artillery occasionally cracking off in the distance. The only words in English come from the Syrian rebel filming the horror before him. All he can say is, “oh my god,” over and over and over again. As of right now, the estimated death toll from this massacre in the northwestern Syrian city of Aleppo is around 80. The country’s most populous city, Aleppo had been relatively untouched by the nearly two year long civil war before the tragedy that unfolded this morning. The bodies themselves were found lying beside the Quwaiq River in the western district of the city’s Bustan al-Qasr neighborhood. 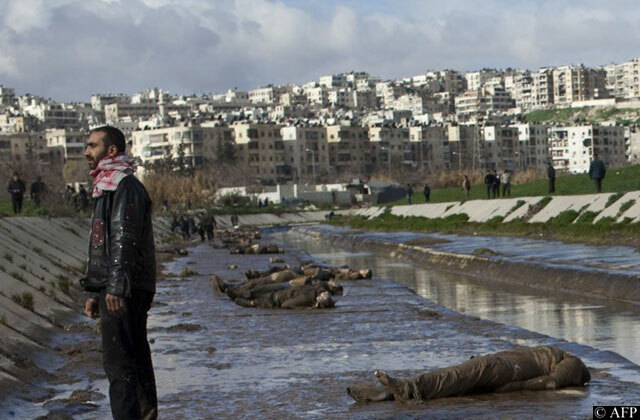 Rebel supporters were able to remove a large number of the bodies from the river to a school courtyard so that families and friends could identify the deceased, but sniper fire from Assad loyalists caused them to abandon their efforts before all of the bodies had been recovered. One rebel fighter said that there were at least 30 bodies lying in stagnant water upstream, but that they were too close to the Assad regime’s front line to risk retrieving. A video posted by The Telegraph (UK) shows members of the community in Bustan al-Qasr huddled around the recently retrieved bodies, which had been completely wrapped in blue tarps except for the heads, which remained exposed. It is evident from the video that many of the victims of the massacre had been dead for well over 24 hours as onlookers were forced to cover their faces with their hands and with surgical masks to cope with the smell of bodies which had begun to decompose. According to locals, the Quwaiq River had become something of a regular dumping ground for corpses for Assad loyalists, citing two bodies that were pulled out of the river the previous week. Both of those bodies, like the 80 or so found today, had all forms of identification removed from them prior to their disposal. At the end of this article, I have embedded a copy of the video uploaded this morning by a Syrian rebel of the remnants of the massacre that had taken place in Aleppo. If you find it disturbing and grotesque, that’s good. You’re supposed to feel that way about mass executions and crimes against humanity. It is conservatively estimated that over 60,000 Syrians have lost their lives during this Civil War, which can be added to the between 110,000 and 1.2 million Iraqis killed over the past decade, along with the still mounting death toll in Afghanistan. These staggering numbers only count a fraction of the human suffering in this region as they fail to take into account statistics such as the estimated 1.2 million Syrians who have been displaced by this conflict or the 2 million Afghani women who have been widowed since the War on Terror began. Now, compare the reality of this to contemporary political discourse in America. We have all but erected a giant middle finger on the hand of the Statue of Liberty to let other nations know just how little we care about them and their people. In case you forgot, the Presidential debate on “foreign policy” lasted about half an hour before domestic issues crept in and consisted almost entirely of debating which candidate loved the military and Israel with the most ardor. Foreign relations have been so detached from the public interest that I doubt if half the country could tell you whether we were still at war with Iraq or Afghanistan. Everything about armed conflict in the 21st century has been so sanitized and spit-shined for our consumption that the Middle East might as well be Middle Earth. We need to see painful footage like this because it removes the abstraction from war and shows us the humanity of its victims. Without these visceral reminders of the cost of combat, the dead are just numbers. 80 corpses lying in the mud is more powerful than 60,000 marks on a spreadsheet. Thanks for a great column! This needed to me said!